SAN DIEGO (Jan. 5, 2011) — Several San Diego Unified School District improvement projects funded in part by Proposition S are now in progress with domusstudio architecture, with Principal Wayne Holtan, AIA, taking the lead. The scope of the work spans three local schools. 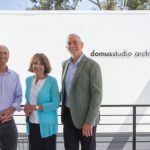 • At Audubon Elementary School in Southeast San Diego, domusstudio is conducting a modernization of the 55-year-old campus. The plan will address Americans with Disabilities Act (ADA) accessibility and includes a new entry, upgraded security, new windows and updated electrical. 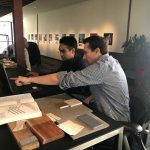 • Drawings by domusstudio are in progress for the School of Creative and Performing Arts, where a College, Career & Technical Education (CCTE) project for a remodeled television studio/classroom will be constructed. 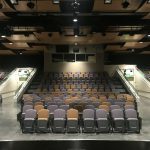 Improvements at the school’s Florence Johnson Grand Theater will include upgraded audio/visuals, acoustics, electrical and lighting. ADA upgrades also are planned at the Theater. • University City High School will see a major campus modernization as well as upgrades to the athletic facilities. New football stadium lighting and artificial turf and track are planned. Passed in 2008, Proposition S is the $2.1 billion general obligation bond program that provides resources for the San Diego United School District to repair, renovate and revitalize 181 neighborhood schools. Proposition S extends the previously voter approved Proposition MM tax rate ($66.70 per $100,000 assessed value of taxable property) from 2029 to 2044.